Avis Homes is involved with many community and construction related industry events. Check here often for relevant information. Avis Homes recently received their CAPS designation from the NAHB. This is the Certified Age-In-Place designation. Being a Certified Aging-in-Place Specialist gives Avis Homes the technical, design skills, and customer service critical to competing in the fastest growing segment of the residential remodeling industry: home modifications and upgrades for the aging-in-place. Michael Avis Jr. joined Koenig & Strey Realtors which is now Berkshire Hathaway HomeServices KoenigRubloff Realty Group in Lake Forest, Illinois. He can be your buyer broker advocate for your next purchase as well as list your home for sale when you are ready to move. Recent tour in Shipshewana, Indiana where we have our custom Amish cabinets made. We now have four local shops to fabricate your custom cabinetry for your projects. 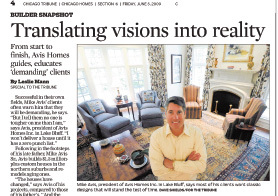 See Avis Homes Builder Profile from the Chicago Tribune dated June 5, 2009. Learn a little more insight into Michael Avis’s philosophy at work and play. Click to see full article. Indoor Sport Court Construction in Wilmette. Summer Cottage Renovation on Lake Beulah in East Troy, Wisconsin. Kitchen Remodel and Master Bath Addition in Lake Forest. EIFS/Synthetic Stucco Tear Off and Cedar re-siding in Gurnee. Windows and Doors Replacements in Lake Forest, Lincolnshire and Deerfield. Library and Home Office Build Out in Lake Forest. Finish Basement Build Outs in Lake Bluff, Gurnee and Lake Forest. Interior Millwork Upgrades in Glenview. Sunroom/Pool House Addition in Lake Forest. Florida Room Renovation in Lake Forest. Kitchen and Master Bath Remodels in Lincolnshire. Window Replacement with Home Maintenance in Deerfield, Green Oaks and Highland Park. Trex and Azek Deck Construction in Gurnee and Lake Forest. New Home Construction in Highland Park.